Whether you’re updating your home heating system or need to bring heat to a space that doesn’t have any, radiators are often what you’ll be shopping for. You might also like the idea of swapping in something rather snazzier than a boring white panel to update your interiors. What type of radiators are there? Choose between radiators that will be plumbed in, or electric versions. They could be replacements or extensions within an existing system, when knowing what you’re after isn’t a puzzle. However, if you have plumbed-in central heating, don’t rule out adding in an electric radiator to heat a space that’s not currently covered by the system. Plumbed-in radiators make use of the hot water created by the boiler to emit heat. They’re controlled centrally as part of the central heating system. Electric radiators work in individual rooms and use mains electricity. Some versions are plugged into a socket, while others will need to be fitted by an electrician. You’ll also see infrared electric radiators on offer. These have a high heat output and are slim, so can be a good small space solution. Getting the right heat output for the space is vital. Radiators come with a BTU rating, which tells you the heat output calculated in British Thermal Units. You can use an online calculator such as this one from The Radiator Company or call on a heating engineer to work out what’s required. Don’t forget that to create even heat large spaces may need more than one radiator if the room doesn’t have another heat source such as a stove. Can you use old or reconditioned radiators? It’s possible to use old cast-iron radiators in a modern heating system. However, they’ll need to be flushed of debris and tested to ensure they are up to the job. Not blessed with original designs? You could bring in reconditioned models. Consider, alternatively, going for modern radiators that have the same period looks but 21st century efficiency. What materials are radiators made from? Modern radiators are frequently made from steel and traditional versions from cast iron, although there are other materials on offer. Stainless steel is extremely durable, and has high heat output and efficiency. It’s generally the most budget-friendly option. Cast iron suits industrial-style schemes and period homes. It heats up more slowly but retains heat for longer once it’s switched off. The material is heavy, though, which will affect where these radiators can be located. Aluminium is light, which increases the possibilities when it comes to where you can hang these designs. It heats up – but also cools down – quickly. What shapes do radiators come in? Horizontal radiators are the classic option. They’re generally easy to fit under windows or wall shelving, so can help make room layout space-efficient. Slim designer versions will fit under low windows. Vertical radiators are frequently used in bathrooms but there’s an array of vertical designs for every room now on offer. They can fit into awkward spaces and also make a stylish feature. Column radiators consist of vertical pipes that may be set, for example, two, three or four columns deep. The more columns, the higher the heat output but the more space the radiator will take up. Towel radiators come in classic ladder designs as well as a whole host of other styles these days. They’ll warm towels and the room. Choose from those plumbed in to the heating system, electric versions, or dual fuel. The latter are plumbed in but also have a switch that allows you to turn on the electric heating element when the central heating is off in summer so your room is warm for showering or bathing and towels are dried. Don’t forget to consider the depth of the radiator when you’re picking a design for a room. Whether a radiator is single or double panel will influence how far it juts out. Single panel designs are, of course, slimmer. These have lower heat output, so are more likely to be the right choice for a smaller room. Double panel radiators produce a lot more heat for the same surface area and will intrude further into the room. Do you need radiator valves? Radiator valves, which control the temperature of individual radiators, are essential for giving you flexibility room-by-room. There are different styles of valve available so you can complement the choice of radiator design. You might hear them referred to as thermostatic radiator valves (TRVs). Where should radiators be positioned? Radiators are frequently to be found under the window to counteract cold draughts. However, if your home is double or triple glazed, this certainly isn’t the only option, making room layouts more flexible. 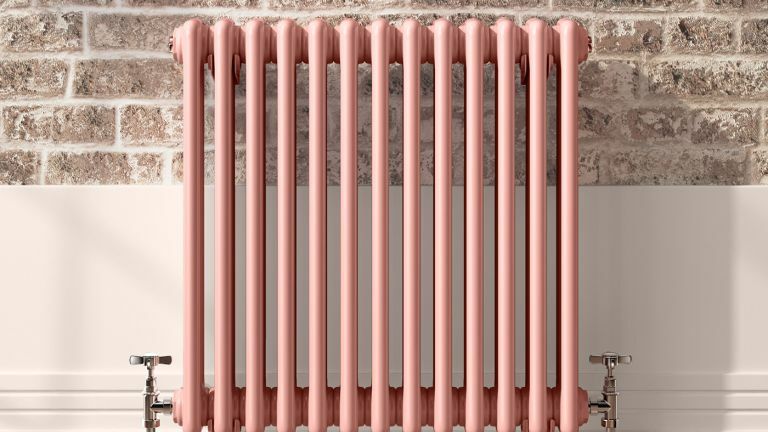 Bear in mind, however, that if you’re swapping radiators into an existing system, the pipes may well be placed with the traditional radiator location in mind. This doesn’t mean you can’t re-position them, but it will entail additional work. The wall itself is also an issue when it comes to the location of the radiator. Masonry, brick or block walls are strong, so the radiator options available are considerable. Studwork walls require that the radiator is hung from the studs, so this can limit both size and shape of radiator. Don’t block the radiator by putting a sofa or other large piece of furniture in front of it as this will stop it heating the room efficiently. Draping curtains over it is also a bad idea. Air can build up in a plumbed heating system, which will stop it working efficiently. Gurgling radiators or one that is cold at the top or has cold patches are all giveaways and, if you live in a two-storey house, you may begin to notice that the radiators upstairs aren’t getting as hot as those downstairs. To counteract this, you need to bleed the radiators, which releases the trapped air. Find out how to bleed a radiator in our guide.